George W. St. Georges Jr. Provide comfort for the family of George St. Georges with a meaningful gesture of sympathy. George W. St. Georges, Jr., of Broad Brook, CT, was called by God on March 29, 2019. Service to others was at the very core of George’s life. He recently received his 50-year service award from the Boy Scouts of America, having served as Cubmaster, District Chairperson, and having maintained an advisory role throughout the years. As a member of Rotary International for over 30 years, he was named a Paul Harris Fellow, the highest honor the organization bestows. His faith fueled this service to others. He contributed his time to St. Catherine Church as a Eucharistic Minister and a member of the folk group. George served 21 years in the U.S. Army, retiring at the rank of Major. It seems appropriate that God called him home on National Vietnam Veterans’ Day, as that was his first active-duty tour. In his “spare time”, he was known to be an avid reader, played Bridge at expert level, and, most of all, cherished any moment spent with his family. George is survived by his beloved wife of 51 years, Karen. He is survived by three children: George III (Theodora), Matthew (Alisa), and Stephen (Christine), 14 grandchildren and 3 great-grandchildren, his brother Paul (June), and sister-in-law Jackie St. Georges, and several nieces and nephews and countless others touched by his kindness. He was predeceased by his brother, Donald. 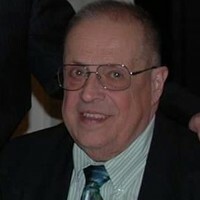 Relatives and friends may join the family 4:00 p.m. to 7:00 p.m. on Tuesday, April 2, 2019, at Bassinger & Dowd Funeral Home, 37 Gardner St., East Windsor. There will also be an additional calling hour prior to the Mass in the church. To send flowers in memory of George W. St. Georges Jr., please visit our Heartfelt Sympathies Store. We encourage you to share your most beloved memories of George here, so that the family and other loved ones can always see it. You can upload cherished photographs, or share your favorite stories, and can even comment on those shared by others. Provide comfort for the family of George W. St. Georges Jr. by sending flowers. May the family of George W. St. George's please accept my sincere condolences hoping you find comfort in God's words at Acts 24 : 15 and Psalm 37 : 29.